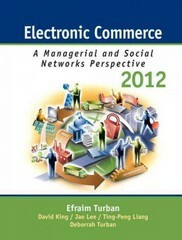 Electronic Commerce 2012 7 Edition Explore the many aspects of electronic commerce through a managerial perspective. Electronic Commerce provides a thorough explanation of what EC is, how it’s being conducted and managed, and how to assess its opportunities, limitations, issues, and risks—all from a managerial perspective. To keep pace with today’s ever-changing technology, the seventh edition has been streamlined—removing material that’s no longer relevant, while still providing information on the hottest topics in the field.